IT WAS definitely lift-off for the Wey & Arun Canal Trust's latest restoration project—a 16 tonne dredger. This occurred over the last weekend when it took delivery of new boats, including the heavyweight dredger. 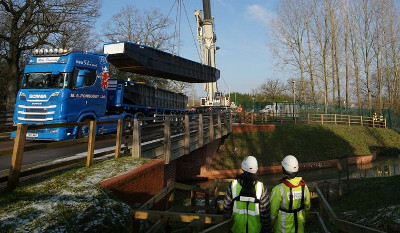 The vessel, plus two barges and a tugboat, had been purchased from local firm Land & Water Services Ltd, and called for the use of a 250-tonne crane to lift the fleet from lorries and into the canal at Compasses Bridge, on the canal's summit at Alfold/Dunsfold on the West Sussex/Surrey border. Civil and environmental engineering experts Land & Water transported the fleet by lorry to the Compasses site from as far afield as Birmingham, along with the crane and 70 tonnes of counterweights. It was an impressive sight as the tower crane’s boom was extended to 34 metres to lift the boats over the bridge and into the water, with the diesel powered tugboat the first to be used, as It was put to use immediately to push the two 40ft barges further along the canal as soon as they were launched. 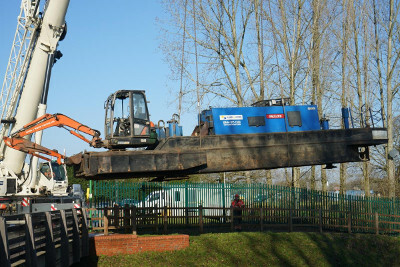 The photograph shows one of the two barges being lifted. Wey & Arun Canal Trust volunteers and Restoration Supervisor Supervisor Dave Evans worked with Land & Water staff for the operation, and to ensure the safety of the many spectators who had turned out on a bitter Saturday morning to witness the spectacle. The equipment will now allow the start of a two-year volunteer-led project to dredge the 550 yards stretch from the newly built Thriscutt Slipway to Compasses Bridge.